Before joining the American Medical Response family two years ago, Kira worked in the public health sector. In fact, Kira continues to volunteer today with county-based HIV prevention and syringe exchange programs. Kira seeks to improve the quality and standard of health care provided in her community by bridging EMS, public health, education, and health policy. Kira is working toward realizing her goal of becoming a physician. 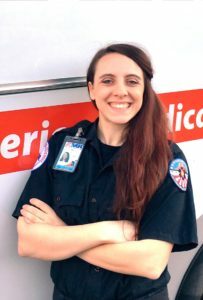 Frustration over an inability to meet patients’ unique needs drove EMT Kira Gressman to action. Kira devoted her own time to researching available community resources for people with socioeconomic needs. Kira then planned and gave a detailed presentation to her co-workers on the various social services to which patients could be referred. Kira also created and distributed referral cards to help team members link patients to appropriate resources.